FRIDAY, May 19, 2017 (HealthDay News) -- People in U.S. emergency rooms may receive unnecessary opioid painkiller prescriptions for minor injuries such as a sprained ankle, a new study finds. This practice -- which varies widely depending on what area of the country you're treated in -- potentially boosts the risk that patients will become dependent on the drugs. "The substantial variation in prescribing patterns of such extremely addictive medications for minor injuries results in many thousands of pills entering the community and places patients at an increased risk of continued use and potentially addiction," said lead author Dr. M. Kit Delgado. He's an assistant professor of emergency medicine and epidemiology at the University of Pennsylvania's Perelman School of Medicine. "It's vital that we identify and understand the root causes of this growing issue," Delgado said in a school news release. The United States is currently in the middle of an opioid addiction epidemic, according to the U.S. Centers for Disease Control and Prevention. Each day, 91 people die in America due to opioid or heroin use. While there's been no significant change in levels of pain reported in the United States, the number of opioid prescriptions has almost quadrupled, the CDC says. The current study included insurance claims for more than 53,000 patients treated at emergency departments for sprained ankles in 2011 and 2012. None had filled prescriptions for opioid painkillers in the previous six months. Only 7 percent of patients got a prescription for an opioid painkiller like hydrocodone (Vicoprofen) or oxycodone (OxyContin, Percocet). However, the odds of getting a prescription varied across the country. For example, less than 2 percent of people in Delaware who had a minor injury were given an opioid prescription. But in Mississippi, 16 percent of patients got a painkiller prescription. When people were prescribed the drugs, the median number of prescribed pills was 20. One in 20 of these patients got 60 or more pills, the study showed. "Looking only at the cases analyzed in this study, if all prescriptions written for more than 20 pills were instead written for only 20, there would have been 37,721 fewer opioid pills entering the community," Delgado said. If these study findings are true in other minor-injury situations, "this likely translates to millions of highly addictive and unnecessary prescribed pain medications filtering into the community," he said. "The study illustrates the potential benefit of laws to limiting new opioid prescriptions for acute pain to no more than five-day supply, as was recently passed in New Jersey," Delgado said. 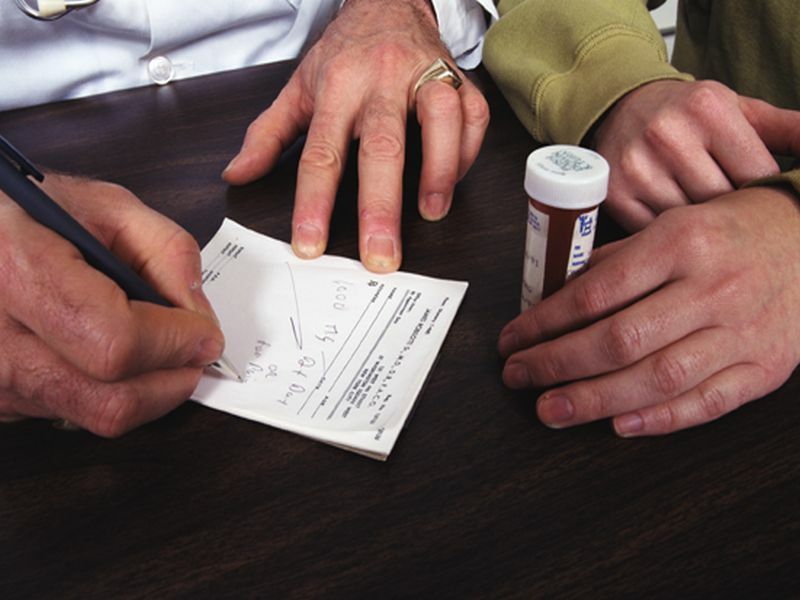 Another recent study from the CDC's Morbidity and Mortality Weekly Report noted that the risk of addiction begins with just a three-day prescription, and it goes up significantly after five or more days. Study co-author Dr. Jeanmarie Perrone is a professor of emergency medicine and director of medical toxicology at UPenn. She said, "an even more critical aspect of this study is that many would argue that opioids should not be prescribed for ankle sprain at all." The study was scheduled to be presented at the Society for Academic Emergency Medicine's annual meeting, in Orlando. Findings presented at meeting are generally viewed as preliminary until they've been published in a peer-reviewed journal.